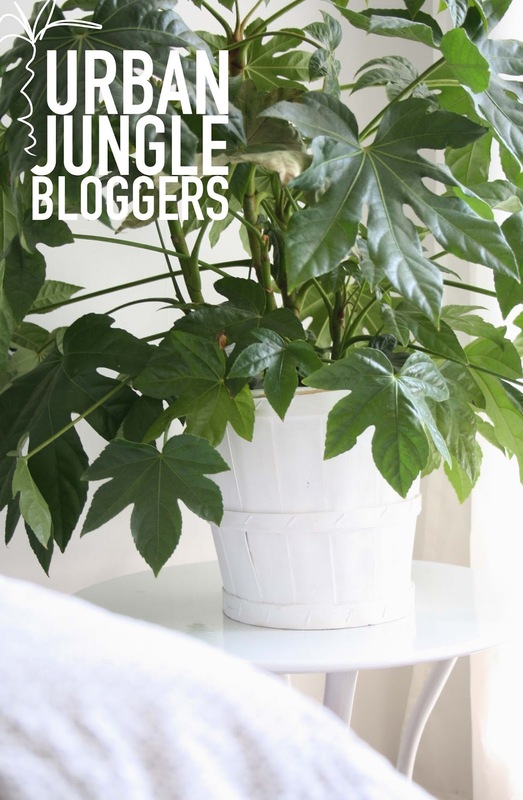 Urban Jungle Bloggers, Plant Pots. Plant pots it the topic for this month's Urban Jungle Bloggers post, or in my case a soap basket/bucket bought at French Market a couple of summers ago. When I bought this Fatsia plant recently from my local B&Q it didn't look that big stood there in the garden section encased in its plastic sleeve, but when I bought it home and removed the sleeve, well it was like having an instant jungle in the room, and as I didn't have a plant pot big enough, I painted up one of the baskets and lined with tin foil to prevent water from trickling out, and it makes for the perfect pot. it also works well with my interior decor and style of the living room, rustic white sort of scandi theme. My other little pot ideas is a take a terracotta pot and paint with chalk paint, perfect for my herbs, and a fun way of using them in decor, leave a little message on the pot! Very beautiful planter ideas! I like the rustic and serene style! Wonderful home & thank you so much for joining us! This is an amazing idea. It adds color to the clean design of the room. Greetings! Very useful advice within this post! It's the little changes that make the most important changes. Checkout my latest blog about Some Awesome Ideas about designing your office!